The band is currently a DUO made up of original members Geri Soriano-Lightwood (Singer/Songwriter), Ramin Sakurai (Multi-Instrumentalist, Programmer). In addition to working with SBL, Ramin produces, remixes, and composes music for artists, television and movies. After a 5 year extended break SBL released its third major studio album, 11i, on February 12, 2008 with Rykodisc Records. I recently had an opportunity to ask Ramin a series of questions about the making of 11i, and on the affect of technology on his process for making music. 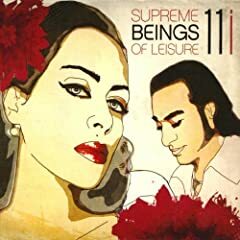 Enjoy the interview and visit www.myspace.com/supremebeingsofleisure for more info on the band. Mark Mosher: What was the primary music production software you used in the creation of 11i? Ramin Sakurai: That would’ve been Protools versions 6-7. Some of the songs started off in other programs like Live or Reason but they always ends up in Protools. Mark Mosher: Can you give us brief overview of your studio rig? Ramin Sakurai: The main studio rig consists of a Protools HD3 with two 192 i/o’s and a G5 dual 2.5ghz. I run a 3.1ghz PC for GIgastudio. I use quite a bit of outboard gear as well. I believe a record can be recorded and mixed entirely in the box but you need a little help with some analog gear. I use Avalon, multiple API, NEVE-type preamps along with various compressors. Mark Mosher: How has the advancement of music production software and ability to produce from a laptop changed your workflow for this album? Ramin Sakurai : It has changed my life entirely. I went through 3 laptops during the time this album was in production and everyone of those computers was “the best computer I’ve ever owned” just for the fact that I got so much done on them. I would sometimes do about 75% of the musical parts for the song in either Reason (which I don’t really use anymore) or Live then transfer everything in Protools to edit, overdub, add parts, and mix. With laptops, my dreams of writing an album in other countries with just a backpack full of gear is a total reality right now. Mark Mosher: I’ve always been a fan of your creative and tasteful use of beat slicing and was happy to hear lots of slicing on 11i. How has your approach to slicing changed since the first album? My approach now is not much different in application except everything is done within the DAW whether it’s Protools or Live. If it’s something I did in Reason then it was back to using Rex Files with the Dr. Rex and using single shots in Redrum. In Protools, I would even slice up the live drum parts beat for beat and up to 10-12 tracks at the same time. You can’t use Beat Detective for something like that cause it’ll throw each track off from one another and tracks like the overheads will sound totally off with everything else. For that I had to group the drum tracks and hit tab (jump to peak) then “b” (or command “e” to cut) repeatedly til the end of the edit point. I would sometimes still use “Edit Smooth” in Beat Detective but I would sometimes have to adjust the start points. In Live, the process of editing drums seems much easier and flexible so I sometimes opt to using that as a writing tool now. Mark Mosher: Do you ever work remotely with Geri via the internet while composing, recording, and producing tracks? Ramin Sakurai: Always! She’s a mom that lives in Glendale and I’m a Westsider in L.A. so the internet is key for our writing… For most people it may not be the most productive way at times but it certainly works for us. I hooked her up with a 002 so she can do her vocal ideas and send me parts so I can rearrange the song if I have to. Once we work and rework, bounce the ideas back and forth, then she comes in and does her final vocals at the studio. Mark Mosher: Lush strings are a part of many of your arrangements. What’s your “go to” instrument or VST for strings? Ramin Sakurai: The Gigastudio. VSL and Sonic Implants. I collaborated Scott Tibbs on this album for the strings and I must say that he is the most brilliant musicians I have ever met in my life. Ramin Sakurai: Still working that out right now but what I can say is I’m using the Roland V-synth, 2 Mac Book Pros (one for running the backing rig and one for video), Rhodes and or Roland Fantom, Korg Kaos Pad, M-Audio Trigger finger, just for starters. I’ll have more info later. Mark Mosher: While touring for 11i, will your goal to be to stay true to the album arrangements or instead mix things up by triggering sequences on the fly? Ramin Sakurai: We are planning to eventually really mix some things up but right now we’re adjusting to this new setup that should make things much more flexible for us. We plan to trigger almost everything live. Mark Mosher: Will you be integrating VJ elements into the live show and if so what software will you be using? Ramin Sakurai: Yes at the moment it’s Arkaos VJ 3.6.1. Mark Mosher: If you were stranded on a desert island with a laptop (solar powered of course), what is the one software production app (Live, Reason…), VST Synth, and control surface/controller would you want to have with you? Ramin Sakurai: It would have to be Live 7, Reaktor, M-Audio Keystation Pro 88. Mark Mosher: How has the the Internet changed the way you connect with your audience? Ramin Sakurai: In every way from the very beginning. We were one of the very first bands to release Macromedia Flash videos online to attract an audience base, this was about 9 years ago now. Now it’s really one of the few ways any band can directly connect other than touring and with online communities like Myspace (www.myspace.com/supremebeingsofleisure) , anybody can simply “get in touch”.